Sometimes we might have to download the video for listening to some audio. For example, these days audiobooks are getting much more popular compared to regular PDF. Because of this, some users are now using YouTube to upload their audio file by making a video. The video just contains cover page image and audio in the background. We usually use such audio files on our smartphone to listen while traveling. But if we directly transferred our video to our smartphone, then we might have to watch the video as well to listen to that audio file. Watching only one screenshot to listen audio does not make any sense. For that, I recommend everyone to separate audio from video file. By this way, we only listen to audio on our smartphones instead of watching any video. There are many software available to convert or extract audio from video files. But what I’m going to show in this post is, extracting audio file from video using VLC media player. I’m sure everyone will be using the VLC player on their system has as their main media player, so you don’t need to download any extra software to extract MP3 file from video files. 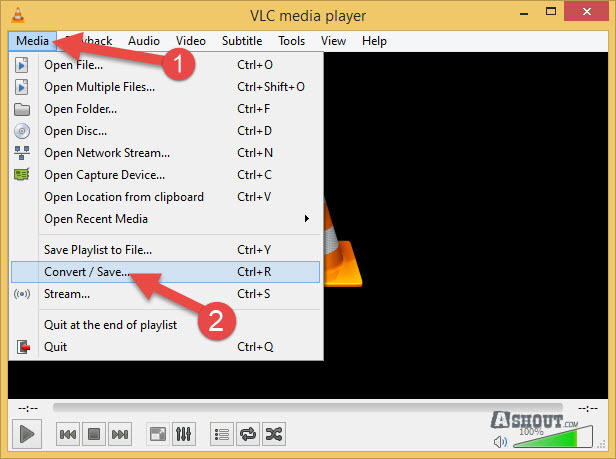 In this guide, I will be using latest VLC player. That is version 2.1.3. 1. First, open your VLC Player. Here click on Media tab and then choose to Convert /Save… option or just press Ctrl+R on your Keyboard. 2. Now you will see Open Media window. Here you choose File tab and then click on Add… button to add video file that you need to convert/Extract MP3 File from it, and then click on Convert / Save button. 3. In the next step choose Audio -MP3 from the drop-down menu. And, under Destination browse the location where you need to save the converted MP3 file, and then click on Start Button to start converting process. 4. Now, wait for few seconds to few minutes (depends on the length of the video file) to convert that file. You will see the status on your VLC player like below image while converting. Once it completes converting (when the blue bar reaches at end of the player) you can play that MP3 file. In this post I have shown only converting Video file to MP3 File. But you use your VLC Player as a converter to convert a lot of other formats as well. You just need to choose the different format (refer step 3) that you need to convert. i tried this after carefully reading all the steps and double checking the screenshots but this did not work. It displayed a vlc error. Please check the file format you are using or try with other video format as well… also do check video guide once. It may help. Previously I was using MyMail Plugin now I moved to sendy newsletter script. Currently in this blog i’m using sendy only. In this blog I’m using Elemin theme. I’m trying to convert a movie clip to an .mp3 file, but when I go to save the destination file, it is always in the .wav file format. I tried switching to all the different “encapsulation” formats, but I can’t get .mp3. I need mp3 for my android phone. If anyone is still around here, advice would be most welcome! Thanks.